I’ve written science fiction, fantasy, horror and slipstream reviews for the Guardian for almost a decade, and before that infrequent pieces for Infinity Plus, Paperback Inferno and Vector. In that time I’ve covered hundreds of books, from the excellent to the execrable, and all shades in between. For the most part the work has been a pleasure – and the greatest pleasure, perhaps, has been discovering writers I would not normally have come across. On the downside are the very few books so bad that they undermined my faith in the written word (they shall remain nameless). It’s far easier to write a review of a book you like. You’re enthusiastic, for one thing; you have more to say about the work. It’s far, far harder to write a negative review of a bad book, a book which was obviously hacked out by a cynical writer for nothing more than the pay cheque. (That, as opposed to a bad book written in all honesty by a writer trying their best, but who just isn’t very good. I can accept that, and what I do when one of these creatures comes along is, more often than not, ignore it). I first noticed it when someone sent me the link to a page on Goodreads with review of my novel The Kings of Eternity. Now Goodreads is a good idea, a forum for book-lovers to express their opinions on books they love (and hate). It contains some good, perceptive analysis, and the usual amount of ill-thought-out dross. (I recall someone criticising Aldous Huxley’s novel Those Barren Leaves for being too old-fashioned! Good Heavens – this novel was written in the early 1920s!) In general the reviews of The Kings of Eternity were positive, but one fellow had a one word response to the novel I’d spent ten years, on and off, writing, and that one word was, of course, “Meh”. Eric Brown reviews for the Guardian and has written over fifty books. His latest novels are Jani and the Greater Game and, with Una McCormack, The Baba Yaga, the third book in the Weird Space series. 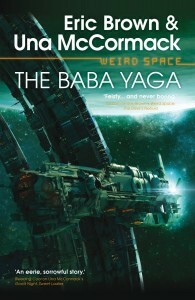 ‘The Baba Yaga’ will be published on July 16th by Abaddon Books.